The family of a 14-year-old boy found dead at a house have said he was a "gentle boy who would help anyone". 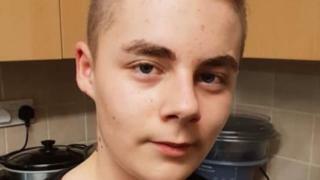 Fourteen-year-old Alex Buchan was found at the home in Fleet Street, Holbeach, Lincolnshire, early on 6 April. A 15-year-old girl and two men aged 19 who were arrested over drugs-related offences in connection with Alex's death have since been released on bail. Alex's father, Alexander, 60, said the death of his son had come as "such a shock". Mr Buchan, a company director, last saw his son the evening before and said: "Alex was such a gentle, kind boy, he really was." "He was so loving and helpful, he would help anyone, and he was loved by all his family. "This has come as such a shock." Mr Buchan said he would not add any further comment while the investigation into his son's death was continuing. Lincolnshire Police said it was investigating the circumstances of Alex's death - no cause of death has been confirmed. Paying tribute, Alex's sister Beth Donnelly said: "I never thought I'd ever have to say goodbye to you, the sweetest boy I know, with a heart of gold. "Rest in peace handsome until we meet again."